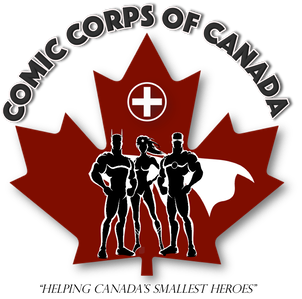 The Canadian Comic Corps is a 100% volunteer supported organization that focuses on delivering comics, and smiles, to children and youth in hospital. Our goal is pretty simple. We want to make it easy to help you to extend your love of comics to kids who could use a little extra support while they are in hospital. We do this by collecting donated comics from great people like you and then delivering those comics to kids in local hospitals with the help of some awesome superheroes! We are interested in donations of comics of any size: big or small!!! Interested? Send us an email by clicking here and we will make sure your comics make their way to Canada's Smallest Heroes!!! If you want more information on the Comic Corps, you can find the most up to date information, photos and donor shoutouts on our Facebook page by clicking here!